Is there anything more romantic than sharing a candle-lit dinner with the one you love? If you’re spending Valentine’s Day in Liverpool you’re spoiled for choice when it comes to romantic dining options. From tapas to steak and the pinnacle of romantic cuisine, Italian, (well it worked for Lady & The Tramp!) the city is bursting with flirty food offerings that Cupid himself would approve of. We’ve put together this handy guide of menu’s and offers to help you and your crush plan a sensational Valentine’s date to remember. The Old Stables restaurant, Allerton Manor invites you to fall in love this Feb 14th and is offering a delicious 5 course menu featuring seared scallops, cannon of lamb and taste bud-tingling desserts accompanied by a glass of champagne and canapés, to help you along the way. Set in the stunning Allerton Golf Club, take in the beautiful South Liverpool scenery and sit back with the one you love. Click here to find out more and enter their amazing Valentine’s competition. The twinkly lights from the boats gently bobbing on the Mersey creates a romantic atmosphere at Liverpool Marina Bar & Grill. Three course dinner, candlelight and entertainment for £49 per couple. Book here. Who says a nice steak dinner has to break the bank? Valentine’s on the cheap is nothing to be sneered at and The Welkin, Wetherspoons pub on Whitechapel in offering two steaks and a bottle of wine for £20! Check it out here. Valentine’s Day in Liverpool has to include a love song, or two! Spend a luxurious evening surrounded by musical legends awaits you at Blakes Restaurant, Hard Days Night Hotel. 4 courses, incuding divine Belgian chocolate cheesecake or strawberry panna cotta plus prosecco and a complimentary gift for £34.95 per person plus an over night stay offer too! More here. Rodizio grill, Fazenda is offering a meat feast this Valentine’s Day with their usual, succulent and filling menu plus sparkling wine and special petit fours to share with your loved one from £25.80 per person. Tasty veggie options are available too. Book here. 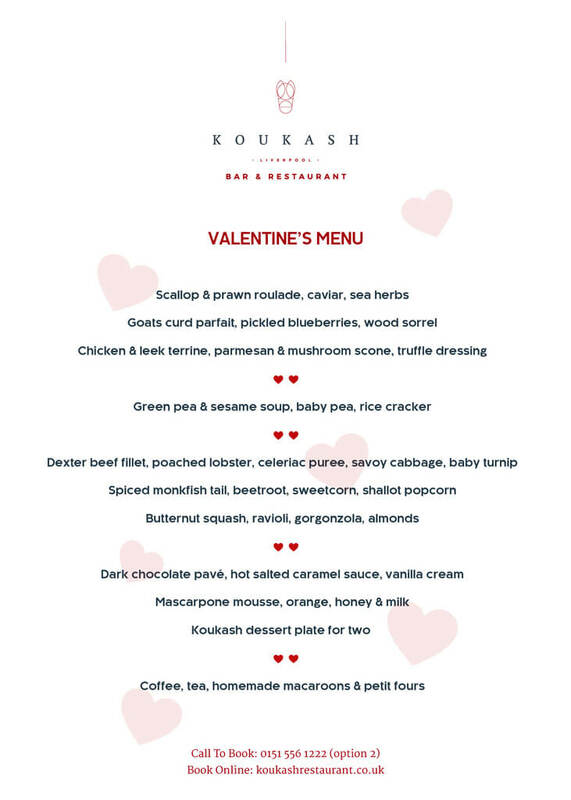 Koukash is housed in a stunning building and you’ll score some serious brownie points with a three course meal, including caviar starters and lobster mains, entertainment and of course a single red rose for your Valentinem from £45 per person. Click here for the menu. Another winning location is Pan Asian restaurant, Matou, Pier Head. On offer is a set menu at £45 per person featuring a delicious starter combination to share, a main course, a chocolately dessert and a bottle of fizz. Click here to book. Owens restaurant, Childwall Fiveways is offering a fantastic value and well planned Valentine’s menu. For £35 per person you and your loved one can tuck into pheasant, hake, brie and a whole host of other beautifully presented dishes. Click here to book. Since the beginning of time food and love have gone hand in hand(unlucky Eve) and sharing a platter bursting with flavours and memories of sunny Spanish holidays can only be a good thing! Lunya, College Lane invite you to dine for £29.95 per person. Book here. Chef Paul Askew has produced a Valentine’s menu that will have you salivating on sight. From seared king scallops to Cumbrian rose veal, it’s an absolute taste sensation. Prices from £58 per person. Go all out and spoil your Valentine here. The king of fusing delicious food and delightful entertainment, Sapporo tepenyaki invite you and your loved one to share a four course culinary show and at just £35 per person you’re sure to get a lot for your money. Click here for details. New kid on the block, Sugar Hut Liverpool is offering a sumptuous three course menu including sharing starters, Chateaubriand for two and four different desserts plus a glass of fizz in seriously stylish surroundings. Book your table here. How about a totally unique venue to spend Valentine’s Day in Liverpool with your one and only? Check out The Floating Grace and climb aboard for a mini cruise and dinner with a difference. There are two sittings/cruises on Valentine’s Day itself and the menu is to be announced shortly. Click here to find out more. Italian cuisine is truly the food of love! Get your passion fix at Il Forno, Duke Street with four courses of authentically prepared Italian delights plus a glass of pink fizz for £35 per person. Click here to book. Have you checked out the beautiful dining room at Marco Pierre White Steakhouse Bar and Grill? Knock your valentine’s socks off with a seriously stylish dinner including Cote De Boeuf, garlic tiger prawns and wait for this…coconut cream and passionfruit meringues! Prices from £11.95. Click here to book. Where better to dine on Valentine’s Day than Paradise Street? Book your table for a three course meal featuring smoked duck breast, pan fried seabass or a huge 32oz Tomahawk sharing steak plus others dishes and a glass of prosecco or beer for £34.95 per person. Book here. This Georgian Quarter poutinere is serving up a treat this valentine’s day with a three course dinner and bottle of wine for tiny £45 per couple. Choose from dishes such as maple chicken wings, sticky-gum ratatouille, crab profiteroles and finish with chocolate fondue to share. Book here. The Refinery is offering a huge range of choices on their three course menu for £26.50 including a glass of prosecco. How does cod and prawn croquettes followed by roasted pork belly and a delectable dessert of baked toffee cheesecake sound? Click here to book. There’s gorgeous food and great value on offer at Pioneer, Liverpool Road. Two courses for £19.95 including dishes such as smoked salmon roulade, cauliflower risotto and belly pork followed by duck and tandoori cod. Click here for more. Fonseca’s Stanley Street are offering two different Valentine’s menu’s, an early evening option at 6:30 or ‘the works’ from 8pm. With dishes such as duck breast carpaccio, Moroccan lamb tagine, and sweet potato and wild mushroom wellington…….and prices from £25 per person, click here to book now! Panam, Albert Dock have set up a brilliant Valentine’s couples package including a four course dinner for £40 per person with additional extras such as a VIP booth, a bottle of champagne, chocolate dipped strawberries and a free pint! Click here for more. Why not go to church this Valentine’s Day in Liverpool as Alma De Cuba welcomes food lovers to the altar. Three courses of divine cuisine and a bottle of fizz for £99 per couple plus there’s also a range of valentine’s cocktails to try out. If you’re going to propose over dinner this Feb 14th…..this is the place to do it! Click here for more. Are you hosting Valentine’s Day in Liverpool? Running an event or special menu and want t0 join our guide? Drop us a line, tweet us @TheGuideLpool or email us info@theguideliverpool.com and we’ll share the love.